In an announcement today, the Government updated their childcare offer to working families and families in receipt of Universal Credit. The updated measures, to be introduced in autumn 2015, bring forward the timetable for the Tax-Free Childcare scheme for working families, and extend support for families receiving Universal Credit. In response to the announcements, Labour claimed that the average family will only benefit by £400 a year, rather than £2,000 per child. But this is incorrect, since it ignores funding which will be transferred over to the new scheme from a previous employer-funded childcare scheme and that £2,000 is the maximum - not the average - expected benefit. 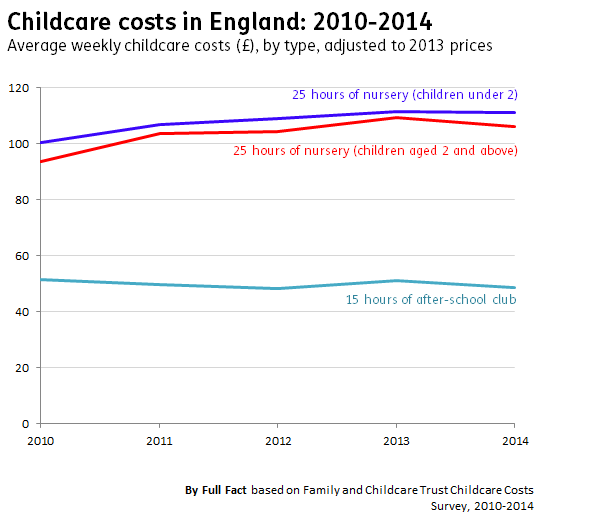 The other claims reflect the figures - but in real terms, childcare costs are falling. The updated plans announced today means that working families (earning up to £150,000 per parent) will now be able to claim 20% of childcare costs up to a limit of £10,000, extended from the original £6,000 limit. Families with children under 12 will also now qualify for support within the first year - rather than the original 7 year period. The Government's report on the tax relief policy states that around 1.9 million families will be eligible for the scheme within the first year of its operation. Labour's claim is based on taking the £750 million per year funding announced in last year's budget and dividing it by these 1.9 million families, which leaves £394.74 per year. But the Treasury told us that the £750m per year was the new funding allocated to the policy - on top of the money which will transfer over to the scheme as the previous government's Employer-Supported Childcare scheme is phased out (this scheme will be closed to new entrants from autumn 2015). The Treasury also pointed out that families are eligible for 20% of childcare costs up to £10,000, but not all families will have childcare costs up to this amount. So it's not the case that families were ever expected - on average - to be saving £2,000 each. The full costings for the policy will be published in tomorrow's budget, so we'll learn more then. When we looked into this £15 billion figure before, we found it related to an estimate in a House of Commons Library note. Lucy Powell's office told us their figure is based on the same analysis, which looks at the impact of changes to child benefits and tax credits, and which the Library told us that they have recently updated. Based on their calculations, the overall estimated impact over the period 2011-2014 is now thought to be just over £15 billion, an increase from the previous estimate of £14.6 billion. The calculation is based on a series of spending reductions (for example, the Sure Start Maternity Grant, the 'toddler supplement' and the 'baby element' of Child Tax Credit) as well as changes in indexation to benefits and tax credits over the period from 2011-12 to 2014-15. The same caveats noted in our previous article on this estimate still apply - and the figures are still estimates, which the Library notes should be handled with caution. Lucy Powell's office told us she was referring to the annual costs survey produced by the Family and Childcare Trust - and specifically the average weekly costs for part time nursery cost for a child aged 2 and over. Since 2010, costs for this have increased by 30% - from £82 a week in 2010 to £106.19 in 2014. But, when we looked at changes to childcare costs earlier this month in real terms, we found that they have started to fall or stagnate. While the Family and Childcare Trust's survey focuses on part-time costs, Laing & Buissons' Children's Nurseries report also found no real growth in average nursery fees in 2012/13. This article has been updated to clarify that average nursery fees have been found to be stagnating as well as just part-time childcare costs.